non lasciarci entrare in tentazione. And do not put us through an ordeal. And do not bring us into temptation. Don’t bring us into the great trial. Do not lead us into temptation. And please don’t subject us to test after test. Keep us clear of temptation. Caveat: I am neither a theologian nor a specialist in Biblical Greek (my specialty is Homeric Greek). And yet the author also gets, by the post title, the issue for the Pope. Is the issue of human agency engaged by the Greek prayer (ostensibly a Hebraic Hellene written transposition/translation of spoken Hebrew Aramaic). With all the news in the USA of public American men being accused by women of sexual improprieties, the question of being led into temptation, or not, is timely for a Pope, a Papa, who is speaking on behalf of God as a Father. Long before the multilingual Pope, there was the multilingual ᎦᎴᎩᎾ ᎤᏩᏘ (pronounced Gallegina Uwati) or “Deer Buck” who studied the Greek New Testament and translated it into his Cherokee. He was given the nickname Elias Boudinot by his sponsor, Mr. Elias Boudinot. In the first issues of the bilingual newspaper in America, which the younger man founded, he printed two different translations of the Lord’s Prayer from Greek to Cherokee. 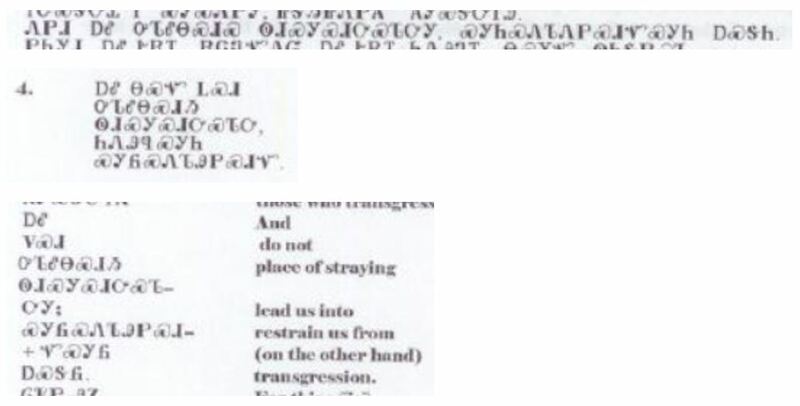 And his bilingual friend, Samuel A. Worcester, then offered a “literal” back translation from Cherokee into English to try to illustrate to monolingual English-only readers how the Cherokee rendered that Greek prayer.